Note : Your request will be directed to Compex Systems. 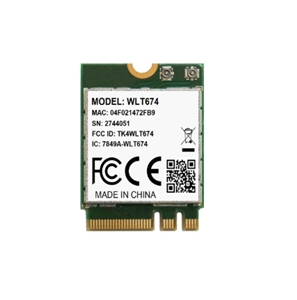 The WLT674 from Compex Systems is a Dual Band Wi-Fi (2.4/5 GHz) and Bluetooth Low Energy module. It is based on Qualcomm Atheros QCA6174A-5 chipset and supports 2x2 MIMO with two spatial streams. It also supports BT-WLAN coexistence and ISM-LTE coexistence. The module requires a 3.3V DC power supply and measures 22mm × 30mm × 3mm. It is ideal for use in medical devices, security systems, robots, video streaming, PoS, digital signs, gaming machine, medical equipment, tablet PCs, handheld devices and thin client devices.